It’s 2019 and the days of little, family run businesses seem to fall more distant in the past. However, there is an upswing in the movement to support small businesses, and it’s spreading through industries across the board. Increasingly, consumers desire to own goods that were made by the same hands they shake after the purchase is made. 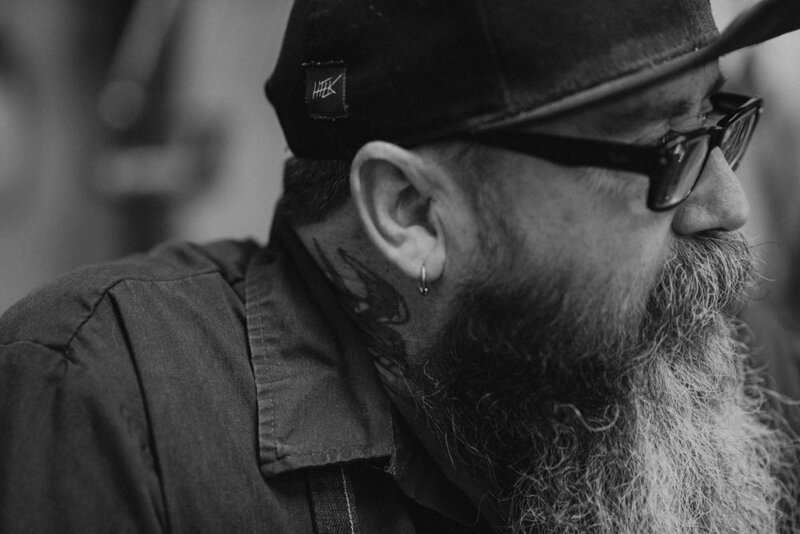 Craftsmanship and intention are major points of interest; and in the world of custom motorcycles, Chris and Rebecca Canterbury are household names. They’re a husband and wife team that has built their life around everything that matters most to them: family, love, and of course, motorcycles. 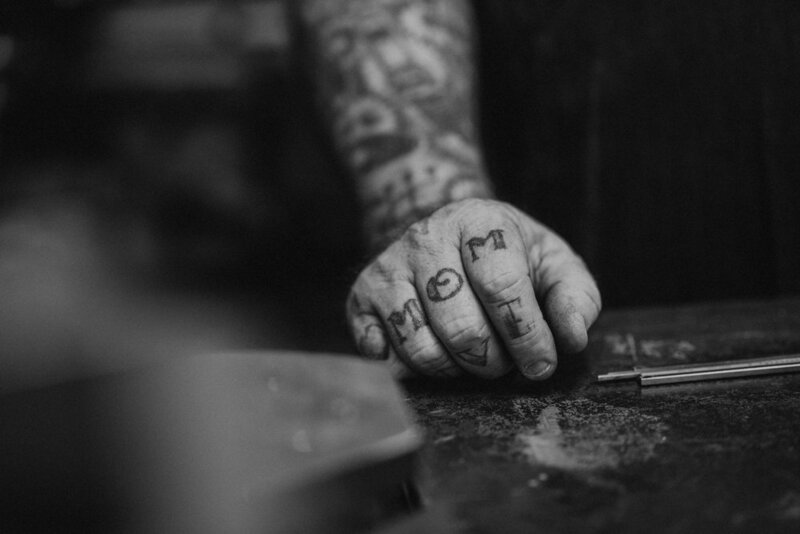 Those three ingredients combined bring us the shop that we are fortunate to know as Boxer Metal. You’ve probably heard of Boxer Metal, whether through the 1 Moto Show, their spotlight on the TV series Naked Speed, or just social media spotting in general. Chances are that if you follow any moto related accounts on Instagram, you’ve seen something from Boxer Metal. 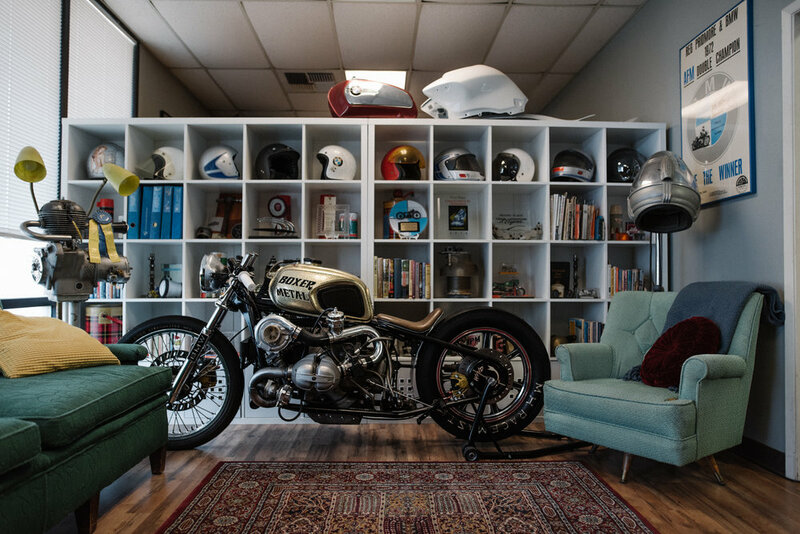 The shop was born in May of 2012 and the goal was simple: build custom BMW bikes, sidecars, and parts with the utmost care and precision. This is a mantra that still holds true today and is backed by the shop’s long track record of beautiful builds. It’s hardly just about the bikes, though. Chris has a presence that cannot be ignored. He’s quiet, he speaks articulately, and he works tirelessly. His laugh is contagious and it’s easy to pass hours just in conversation with him (with his favorite red wine, of course). He fits the bill of the character whose eyes light up when you ask him about his favorite car or bike or experience. He grew up immersed in automotive culture from the very start. He was a part of many facets of the community, but BMWs took hold of his attention the tightest. With a strong penchant for fabrication and design, he knew he had to do something to satisfy his urge to build. When your true joy is working with your hands, nothing else will do. 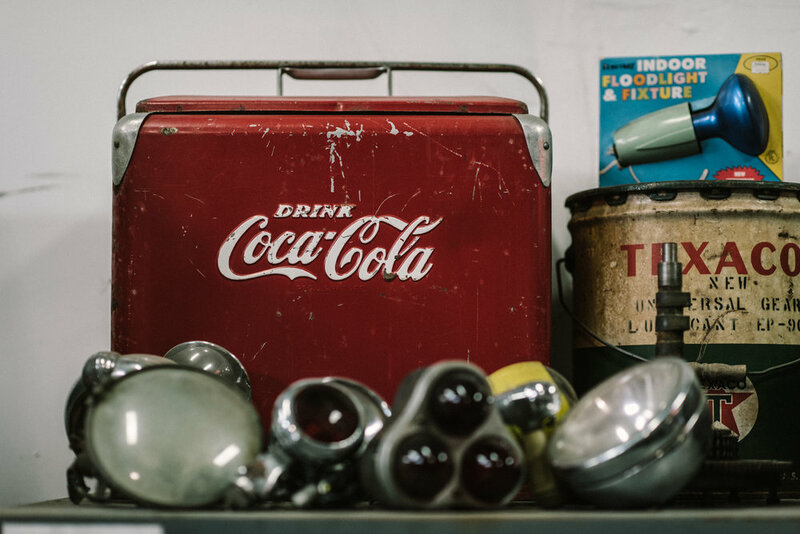 Rebecca is a lover of all things vintage and creative. She shares a similar demeanor with Chris and is a type of compassionate and giving that I haven’t really come across before. It’s clear that she is enamored with everything about her life and takes her passions very seriously. As much as she loves Bakelite, traveling, and her dogs, her love of motorcycles is an equal match. Her creative talents lend themselves to her role as the official Boxer Metal photographer, social media manager, customer service specialist, and all around badass, among other titles. 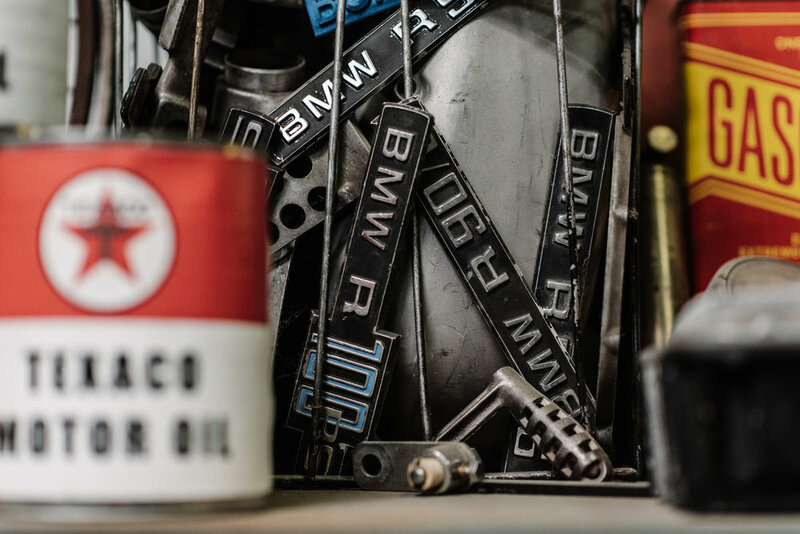 Boxer Metal is what I would call understated BMW Motorrad royalty. 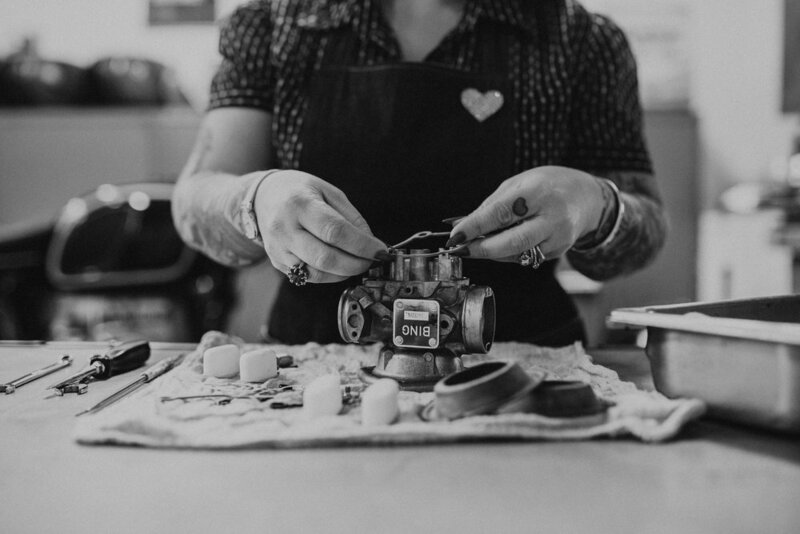 The business is run entirely by Chris and Rebecca from their shop in Chico, CA—everything from bike and sidecar building to marketing to product design is done in house. The shop space itself is slightly smaller than you might expect, but that doesn’t stop progress on any front. The walls are lined with lockers and tool boxes, all perfectly aged. A mix of vintage and novelty signage covers the walls, all centering around the love of riding. Not surprisingly, the shop has just as much character and life as Chris and Rebecca have. It’s a wonderful place to be. Although they’re based out of one shop with no employees other than themselves, they’re known worldwide for their craftsmanship and genuine personalities. 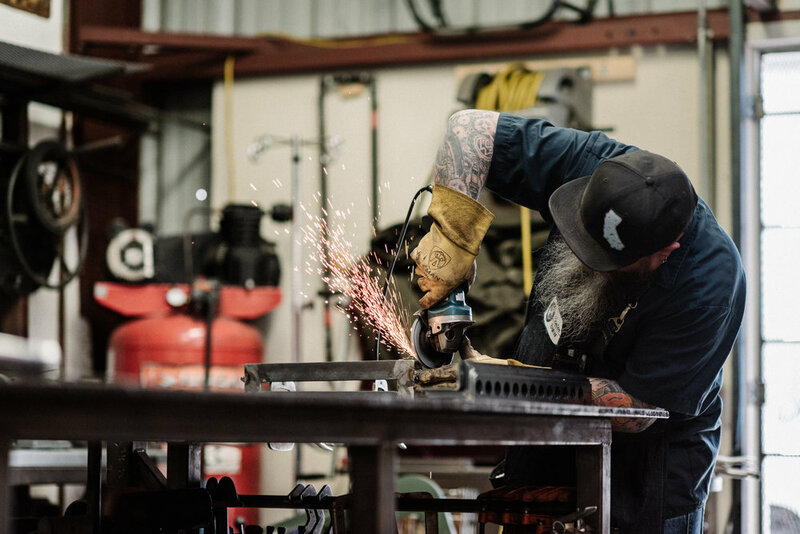 Over the years they’ve traveled to shows both nationally and abroad, showcasing their builds and connecting with enthusiasts everywhere. Because Chris grew up surrounded by Porsche, Volkswagen, BMW, and more, you might wonder what made him choose to solely focus on BMW bikes. 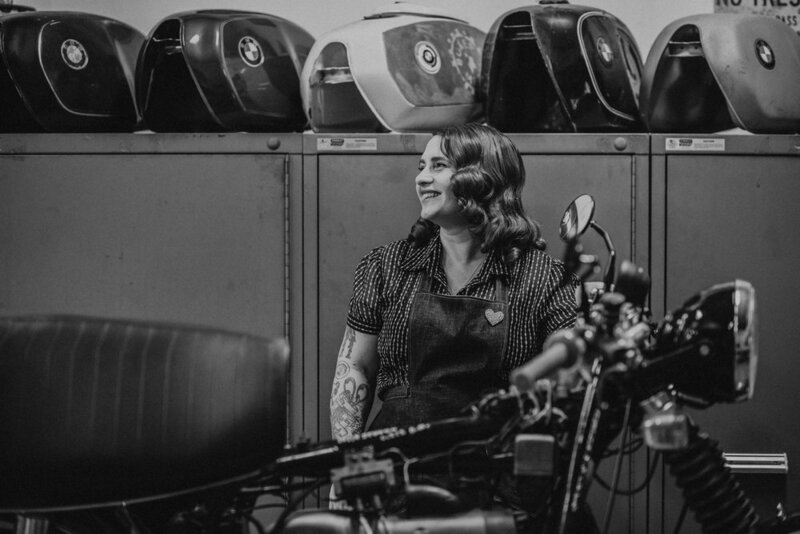 You could call it a team effort in some ways, as Chris is drawn to the simplicity and easily moldable platform of BMW design, and Rebecca has always had a love of vintage bikes. Opening the shop was really one of the most viable options for two people who are so driven and inspired to build. Being full time business owners of a world renowned shop is no easy task, but getting to watch Chris and Rebecca in action speaks volumes for their ability to work together efficiently while clearly enjoying their jobs. This isn’t to say that it’s always breezy, though—as one would imagine, maintaining a business with your partner 24/7 is both incredibly rewarding and difficult. But when asked what their favorite part of running the shop is, their answers are simple: getting to work with each other. Working in the field of your real life’s passion means that it will show through to most people you encounter. While it may sound like a selfish endeavor to do what you love, it isn’t. In a strange way, it’s more for other people than it is for yourself. Running a shop is one of the most customer service centered businesses you can operate, and Chris and Rebecca thrive on it. Rebecca pointed out that there is somewhat of a “normal daily flow,” but that no two days are quite the same. 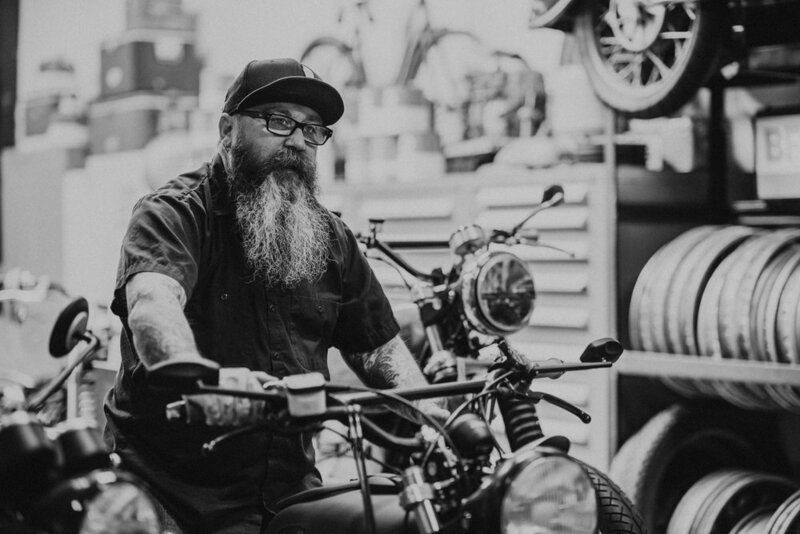 Between updating customers on their bikes, making shipments on time, and managing the shop’s social media, it’s a full time job and a half. Additionally, Rebecca acts as another mechanic beside Chris. It’s a short yet effective assembly line. While I could go on and on about how fantastic Boxer Metal is, I think it’s more effective to just show you. 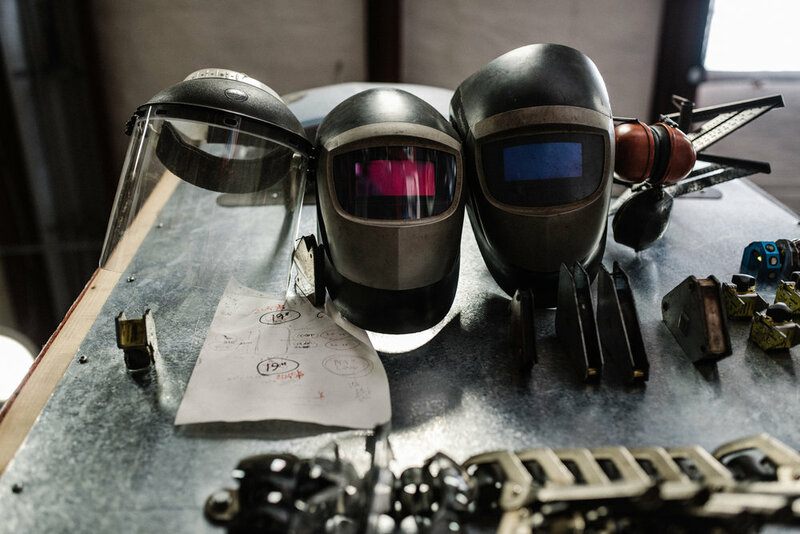 This story serves as part one of three in a series about Chris, Rebecca, and the beautiful machines they create. The next two parts will focus on two bikes they’ve built in recent years; they’re projects that show versatility and vision, and they perfectly demonstrate what Boxer Metal is all about. Please stay tuned for the upcoming stories, and while you’re here, pay a visit to Boxer Metal on their website or Instagram: @boxermetal.